Jump to the latest ski holiday reports. I started skiing in around 1984 when I got my first Christmas bonus and vowed to spend it on something I'd always wanted to do. That trip was to Mayrhofen in the Austrian Tyrol. The snow was great, the sun shone during the day and in between falling over and getting just a little frustrated at my girlfriend's greater progress (I think women really do pick it up quicker), I fell in love with skiing. Lauren's first go at Kaprun. The following year, I was a free man, so I talked a couple of friends into another week in Mayrhofen. This time the conditions were poor (as they often, sadly, are in Austria) with lots of ice and no way to ski back to town. But we still had a great time and I'd suggest that anyone who has learnt to ski on the sheet ice of low Austrian resorts will never have reason to fear. In Canada, a couple of years ago, people were describing hard packed snow as ICE. Needless to say, us Austri-o-philes just smiled and lapped up the conditions. One of my friends who'd come skiing to Mayrhofen with me, joined me the following year on a 2 week binge to Schladming in the Styrian mountains of Austria. This was great. It snowed a lot and we went to a Fasching party which lasted all night and into the following day. Only down side was, aside from the party, that there wasn't much to do in the evening and so we wiled away most of them at the local skittle alley. A group of 6 of us went self catering to Bardonecchia, Italy the following year. When we arrived the was virtually no snow, but it snowed heavily the first night we were there and all through the next day, giving great conditions and a fun week. The resort's not huge, but for my standard then, it was plenty for a week and held its snow much better than the nearby Sauze D'Ouze resort. By this time, I'd met Mandy and, although she'd never been skiing, she was keen to try it. As she'd just bought a house, we decided to have a really cheap skiing holiday and settled on Borovets in Bulgaria. This turned out to be a really bad season for snow and it was very icy on the nursery slopes. Some days Mandy was in tears after a day on the slopes, but thankfully the higher slopes had good snow on and when she progressed to these runs, she started to enjoy it. Overall, Borovets is like a small Austrian resort for skiing. When we were there the equipment provided was brand new, but I've heard less than good reports of it since. Unfortunately, Communist Bulgaria was not blessed with an abundance of good quality food and, aside from a trip with my ski instructor to a top hotel in Sofia one night (In a Moskvich with no lights on a twisty mountain road! ), the food could best be described as poor. Fortunately, Mandy was not totally put off skiing by her experience in Bulgaria, so we decided to have a fortnight in Austria the following year. We looked at the brochures and decided that the Grossraum area looked promising. This area includes the resorts of Soll, Ellmau, Schefau and Westendorf, as well as a couple of other small resorts. We stayed in a small guesthouse on the edge of the notorious Soll, so it was quiet. We both really enjoyed our time, spending the first week in ski school and then skiing together in the second. I subjected Mandy to her first Black run, which she survived. Overall this area is great for beginner to intermediate skiiers. Having skiied it more recently, I'd say it's not particularly challenging for better skiiers, but it's still a good place to go, having plenty of pistes to choose from. Mandy waits for the lift in Les 2 Alpes. Our next skiing holiday was to Kirchberg, the smaller town in the Kitzbuhel ski area. Unlike the bigger town, there is little chance of being miles from the lifts in Kirchberg and it is well served by chair lifts and ski buses to the main gondola just out of town. Conditions were poor when we arrived, but after half a day of torrential rain, it began to snow heavily and, after around 36 hours of it, there was enough to make most of our fortnight highly enjoyable, although it was getting icy on the last few days. This is my favourite ski resort and probably Mandy's too. The skiing is varied, with blues, gentle reds, tougher reds and the awe-inspiring Streif race course to tax skiers of virtually any standard and it is a big enough area to ensure you can ski all day and not queue, with a little ingenuity. If I could only ever ski in one place for the rest of my life, I'd pick Kitzbuhel, although the conditions can be poor as it is, like most Austrian resorts, very low. 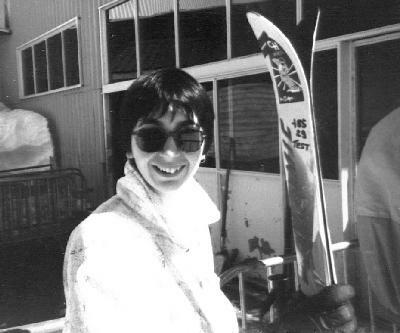 In 1991, Mandy and her sister went to visit their great-aunt in New Zealand, so I linked up with my friend, Nigel, who'd been skiing with me in earlier years. He'd planned a trip with some other friends to Val D'Isere. They'd booked a fortnight and I was able to join them for the second week. The journey was hell. I finally arrived there at about 2.30 in the morning, but the chalet maid had waited up for us and a much appreciated coffee was waiting. The next day I badgered the others to get up and get skiing, although being at the end of the first week they weren't as keen as me! The skiing in Val D'Isere is really good. 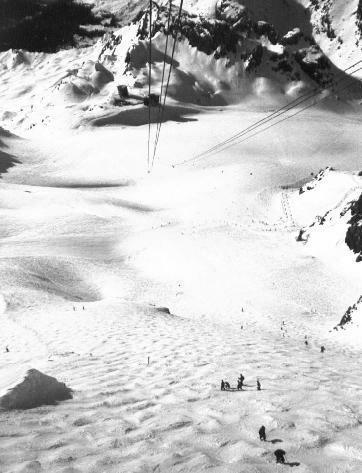 You can ski over to Tignes and there are great pistes for all levels and the off-piste is, to say the least, extensive, although at that time my off-piste skills were not, shall we say, honed. The downside with this area is that a) it's very expensive and b) there are a couple of bottlenecks in the lift system between VdI and Tignes. Overall, though, it was a good week's skiing. Me recovering from destroying an avalanche fence in Les 2 Alpes Having got heartily fed-up with airports and coach transfers. We decided to drive to St Anton, Austria in 1992. The drive wasn't bad, taking about 8 hours from Ostend to St Anton (including one memorable moment when the Calibra's speedo was showing in excess of 140mph). We went to bed for a couple of hours and then picked up our rental skis and had a couple of hours skiing...better than we'd manage on a normal package trip. St Anton has a reputation for tough skiing, but our experience suggests its due to the conditions as much as the runs. Overall, the pistes are great for intermediates, certainly not beginners stuff. Off-piste is where the good skiiers will find their enjoyment and we were lucky in that the snow was great and I had plenty of time to try to learn the art of powder-hounding. During the 2 weeks we had in St Anton, we also skiied at Lech and Zurs and also at the little known resort of Sonnenkopf. Lech and Zurs offered more open, cruisy skiing than St Anton. Very pleasurable for a change from St Anton's mogul ridden blues!. This rates as one of the best ski areas we've visited, but the town of St Anton doesn't score high on the 'alpine charm' scale, being cursed with a major railway twixt town and slopes. 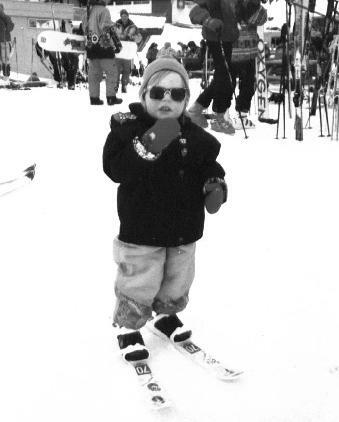 In 1993, we left booking our skiing holiday very late as Lauren was born in the previous September, but we finally got around to booking a cheap, self catering trip to Les Deux Alpes. We ended up as a party of 6 as Nigel, his sister, Nicola, Steve, a friend of Nigel's who'd been to Schladming with us and Elaine, a friend of ours whose husband was too busy motor racing to go skiing, joined us. It wasn't a great holiday, as the best runs in Les Deux Alpes are the lowest and the snow was notable by its absence at resort level. In addition, the appartments were no more than adequate. On the good side, the snow was fairly good up high, we had a fun time in the evenings and we took a couple of trips to other, nearby, resorts. Our first trip was by coach to Serrre Chevalier. Nigel had been there before and the snow was in much better condition there than in Les Deux Alpes. We enjoyed our day skiing there (more to come). The second trip was less successful on the skiing front, but had its own reward. We took a helicopter from Les Deux Alpes to Alpe D'Huez. Flying over the alps in a helicopter was a great experience, but we soon realized why everyone was helicoptering INTO Les Deux Alpes. The snow in Alpes D'Huez was much worse than our resort, although the snow cannons did succeed in producing slush paths back to the resort centre. The area, however, looked good given decent snow conditions. On the whole, though, I don't think we'd recommend Les Deux Alpes. In 1994, Mandy and I treated ourselves to a trip to Verbier in Switzerland. The biggest shock was how expensive everything was. It was so dear that we hardly ever ventured beyond our hotel restaurant in the evenings and returned with more money than we normally do. The good side of this was that we were fresh to ski hard all day every day and we frequently caught the first lift up and returned in twilight. The area is excellent, including the Tortin (which Nigel had Mandy losing sleep over before our visit) and the excellent runs on top of the Mont Fort glacier. It extends out to Veysonnaz and also to the small resort of Bruson, if you take a taxi (which gives you a chance to eat in the excellent cafe on the railway station). Hopefully, we'll save enough money one day to return to this area as it ranks as one of our favourites. 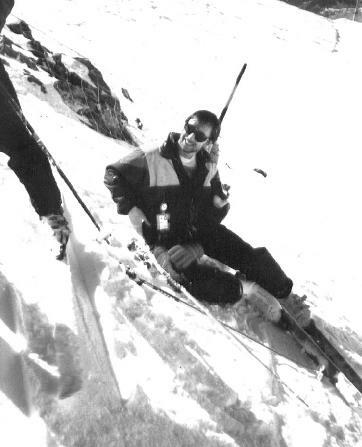 The following year we were living in Munich, so we went skiing virtually every weekend. With resorts like Kitzbuhel and Soll within 90 minutes drive we were spoilt for choice. It says a lot therefore for Kirchberg that we returned there more often than any other resort, spending about 10 days in total there, including two long weekends when we stayed at the excellent Filzerhof gasthof. Our first couple of trips were to the Kaprun glacier, near Zell-Am-See, but this was strictly for novelty value as it is prone to huge queues and high winds. As well as Soll, Westendorf and Ellmau (in the Grossraum), we also visited the visually amazing town of Bad Gastein. Renowned for its casino, this town is built onto the walls of a cliff and, with a huge waterfall in the centre of town, almost defies belief. We stayed for a weekend (in a none too great hotel) and the skiing was enjoyable in a 'lots of cruisy runs' sort of way. Nothing too challenging, but plenty of pistes to enjoy. I wouldn't rush to return, but I wouldn't be unhappy to do so. We also spent a number of days in Garmisch-Partenkirchen, the best known German resort. This has plenty of skiing for a couple of days, but wouldn't tax a good skiier. On a previous visit to a friend in Munich, I skiied up on the glacier, which sticks in my mind as one of the very best days I've ever spent on a mountain as the cloud hid the peaks and we travelled up on the train which goes through a tunnel for miles. The sight of beautiful sunlight and blue ski on near-perfect snow was memorable in the extreme. We also skiied at the smaller German resort of Lengries, which was pleasant for a day, but suffered from old lifts and huge queues. After a season of skiing every weekend, a trip to France or Austria would've seemed tame, so we decided to go to Canada and ski in Banff and Lake Louise. This fortnight was remarkable for a number of reasons. Firstly, it took us less time to get from home to our hotel in Banff than it does to get to French or Austrian resorts. The Air Canada scheduled flights were excellent in every respect and accomodation was comfortable and roomy by European standards. Eating out was cheap by British standards and the choice of restaurants in Banff more than enough for two weeks. On arrival we found temperatures of -30c, which was a bit of a shock and skiing in -20c was probably more so. The locals were staying in, but we'd come to ski! We both joined the Club Ski school, which works in 3 day cycles, taking you to Norquay (pronounced Nor-KWAY), Sunshine Village and Lake Louise on subsequent days. The instructors were competent and friendly and we both took a second 3 day stint as we were enjoying it so much. I skiied a lot of off-piste, which was new to me and, although I struggled, I enjoyed it immensely. Certainly, Canada rates highly in our estimation (all three areas were great for skiing and the snow was excellent) and we think we'll take our kids there when they are old enough for ski school as the lack of language differences (Oh yeah?) will undoubtedly make it more enjoyable for them. In 1997, Mandy was 6 months pregnant when we went skiing, so it was strictly one week early in the season. She found a cheap hotel (The Frejus) in Serre Chevalier, the first week of January. As we'd liked Serre Chevalier on our day trip there, we looked forward to it. Unfortunately, our trip to the resort took longer than that to Canada the previous year and our 'hotel' turned out to be full of school kids (some arriving at 2 in the morning). On the positive side, the food in the hotel was great, thanks to a skilled and enthusiastic chef and it was mere steps from one of the main gondolas. This could've been a disaster of a holiday, but thankfully the Gods smiled on us and gave us (well me really, as Mandy didn't ski much - just the odd blue and a black!) probably the very best snow I've ever skiied on, including that in Canada the previous year. I joined the ESF and myself, one Frenchman and an instructor tried out every exciting off-piste area we could find. All the instruction was in French (lack of demand for more advanced ski school not making it worth doing in English - Why do so many British skiiers think instruction is unneccesary after a couple of years? ), but I muddled through and enjoyed every second of it, although it highlighted that I'm not as fit as I was a couple of years ago. We took Lauren for the first time and she took to it really well. The Ski School kindergarten was a dead loss, but with Mandy and later a private instructor, she soon picked up the basics of the snow plough and was able to ski down a green run holding onto one end of my ski pole. What's more important is that she enjoyed it!